The NFL draft hasn't been viewed as this mediocre for quarterbacks since 2000. Then again, "mediocre" is a loose term. While the 2000 draft didn't feature a quarterback drafted until No. 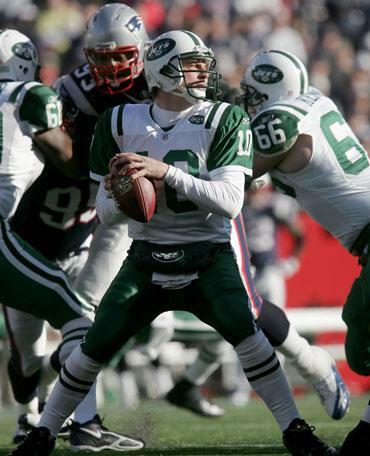 18 overall (Chad Pennington by the New York Jets) and is the last time that a passer didn't go in the first half of the first round, it's the same draft that produced Tom Brady in the sixth round. That fact should demonstrate just how inexact the science of selecting a can passer be. With that in mind, for all the knocks on guys like Geno Smith of West Virginia, Matt Barkley of USC and many of the other young passers available, who knows what this draft is going to look like in five or 10 years? Today, however, it looks questionable. On Thursday, first-year Arizona Cardinals coach Bruce Arians put it in the most telling terms. "We were going to take the best player available at that position, at No. 7, whether it be a tackle, pass rusher, corner, or quarterback," Arians said on Fox radio before narrowing the field even more. "Right now I don't see a quarterback in this class coming up that would have been in that spot for us. Now, it might be for somebody else, but not for us. Especially with the elite offensive linemen that are out there this year, and defensive linemen." Arians knows a thing or two about quarterbacks after stretches of coaching Peyton Manning, Ben Roethlisberger and Andrew Luck in his career. An AFC general manager was likewise blunt: "If either Smith or Barkley were that good, you wouldn't see the trades you're seeing right now. [Alex] Smith? [Carson] Palmer? [Matt] Flynn? That tells you what you need to know. If Kansas City thought there was a great quarterback in this draft, or even a really good one like Matt Stafford, they wouldn't have traded for [Alex] Smith." "I could see both of those guys going in the first round," an NFC executive said of Geno Smith and Barkley, echoing remarks made by many scouts, coaches and fellow executives. "But neither of those guys makes you think you're getting a slam-dunk, no-doubt guy … you're not talking about [Andrew] Luck and [Robert] Griffin." Another AFC executive said he believed that Smith would end up being a top 10 pick, perhaps somewhere around No. 4 or No. 5. With the Cleveland Browns, Buffalo Bills, Jacksonville Jaguars and the New York Jets all needing a quarterback, the executive reasoned that someone will take a chance on him. "Somebody is going to fall in love with him between now and [April 25]," the executive said. In the meantime, Smith, Barkley and others in this year's class will be subject to great scrutiny. Not a student of the game," Nawrocki wrote. "Nonchalant field presence — does not command respect from teammates and cannot inspire. Mild practice demeanor — no urgency. Not committed or focused — marginal work ethic. Interviewed poorly at the [NFL scouting combine] and did not show an understanding of concepts on the white board. Opted not to compete at the Senior Bowl and has approached offseason training as if he has already arrived and it shows in his body with minimal muscle definition or strength. Has small hands and glaring ball security issues [32 career fumbles]. Really struggled handling the snow in Pinstripe Bowl [took two safeties] and will be troubled by the elements. Needed to be coddled in college — cannot handle hard coaching. The harsh personal remarks echoed similar things Nawrocki wrote about Cam Newton before the 2011 draft. While most people have not been as critical of Smith on a personal level, it's not because Nawrocki is completely wrong. "It probably depends on who you talk to," the NFC executive said. "Some scouts see nonchalance and they take that to be lazy. Some see quiet competitiveness. That's why you cross-check and listen really carefully." That said, NFL Network draft analyst Mike Mayock echoed a lot of the concerns about Smith from a football side. "It's absolutely the football side," Mayock said on the network's "Path to the Draft" program. "Talk about the football issues: First of all, ball security, ties into the pocket awareness. Whatever that number is, 30, 32 fumbles in his career, he has no awareness of the rush surrounding him. So his pocket awareness — five sacks in the first half against Texas, three of them he could have gotten rid of the football easily, and one of them he was stripped of the football in the end zone for a touchdown. There's no internal clock, there's no feel." Meanwhile, Barkley has been taken to task for lack of arm strength on key throws. 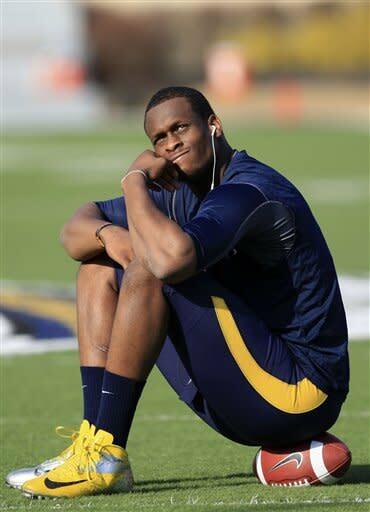 "The kid has all the intangibles you could imagine," one of the AFC executives said. "You couldn't ask for a better kid or a harder worker. But he just doesn't have the arm on the deep stuff." More specifically, scouts have said that Barkley doesn't have the ability to fire passes to tight spots on the field, relying mostly on timing to land throws. With that in mind, Barkley sounds like Pennington. "That's the comparison I would make," the AFC executive said. "That's what people said about Pennington way back then." • Is JaMarcus Russell really on the verge of a comeback?